The Calendar of Cotswolds Events and Festivals, 'What's On' and 'Things to Do' covers events staged in the English counties of Gloucestershire, Warwickshire, Worcestershire, Oxfordshire, Wiltshire and Somerset making up the Cotswolds and would be of interest to the tourist visiting and holidaying in the region. This Cotswolds.Info website is visited by an average of 6500 visitors per day. We are quite happy to publish your Cotswolds Charity Event on our very popular Events Calendar totally free of charge but we do normally ask for a hyperlink back to our website in return. Please note we make a charge for publishing commercial events. For your very important Event this high visibility space at the top of the Calendar is available and we do make a charge - for a quotation please contact us. An exhibition of original oil paintings and pencil drawings. Each tells a tale of our love of country tails. Come enjoy the exhibition and meet local artist, Sam James. Come and join us for a Valentine’s night special market – great variety of stalls, lovely supper (eat in or take away) and of course our well-stocked bar. Thank you for supporting us during 2018 – once again we will be putting our profits back into community projects. The market has now given over £4000 to village organisations. 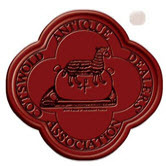 The Cotswolds Art & Antiques Dealers' Association Fair returns to the elegant setting of Blenheim Palace . Lady Henrietta Spencer-Churchill, eldest daughter of the present Duke of Marlborough, is the Patron of the Association. Thousands of visitors came to 2018's hugely successful event. The best and rare examples of every discipline will be showcased by many of the Association's members, creating a rich tapestry of history and culture. The fair is the perfect place to hunt for the best that the Cotswolds has to offer, and promises to be one of the best quality events outside of London. Everything is for sale with prices ranging from £100 - £100,000. Why not make a day of your visit to the Antiques Fair by booking an Afternoon Tea or Picnic Hamper? Call 01993 813874 for more information and to book. 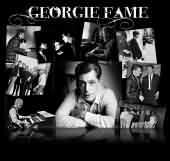 Whether you remember the sixties, or arrived on the planet much more recently, it is very likely that you have been influenced by the contribution that Georgie Fame has made to jazz, pop and contemporary music. Playing festivals, appearing on the BBC with Jaimie Callum, and featured on Diana Krall‘s cover of his early hit “Yeh Yeh” on Krall’s Wallflower album released in 2015, he still retains his unique unmistakable voice. So far there have been more than twenty albums and fourteen hit singles, including the Number 1’s: Yeh Yeh, Get Away and The Ballad of Bonnie and Clyde. Add to this a long list of collaborations with some of music’s most famous names, including Muddy Waters, Gene Vincent, Bill Wyman, Eric Clapton, Van Morrison and Diana Krall, amongst many others, and in Georgie Fame you have bona fide music legend! 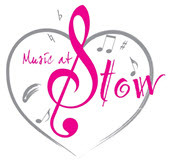 Music at Stow is very excited to be presenting this extraordinary performer for one night only, in the famous 12th century St Edward’s Church, just off the main square in Stow-on-the-Wold. The villages of Kempley, Oxenhall & Dymock within the “Golden Triangle” will once again celebrate the birth of spring when carpets of wild daffodils burst forth for visitors to see. Visitors can expect a wide range of activities across the three villages. The programme includes weekend events at each village with organised walks, luscious Daffodil lunches, teas, exhibitions in the local churches and at Kempley trips on the Daff & ride bus. This year, Awnells Farm, Countryside Restoration Trust will also offer a farm open day. Free parking is available at all the venues and full programmes are shown below and online. Two days of excellent countryside demonstrations in the indoor and outdoor arenas, Fabulous shopping opportunities including country clothing, rifles, gun accessories, gundog equipment, feed, stalking equipment and much more. The World Famous National Hunt Racing Festival at Cheltenham racecourse. 01242 513014 Cheltenham Racing. At the Parabola Arts Centre, Cheltenham. It is in Aid of Macmillan Cancer Support. biography is the subject of the very first BibLit. Book your tickets to hear leading authors Jane Ridley, Anne de Courcy, Christopher Wilson, Caroline Sandon, Charlie Hart, Angela Levin, Sandra Howard, Victoria Summerley, Jessica Douglas-Home and Bob Low share their passion with you. This concert is in aid of the St Andrew's Church Spire Appeal. Cheltenham Choral Society invite you to join them for their spring concert. They are singing two works by Gabriel Faure, the moving Requiem and the beautiful Cantique de Jean Racine. They are also performing works by Vivaldi,Stainer and Stanford. Fauré’s Requiem was composed between 1887 and 1900 and the final familiar version premiered at the 1900 Paris World Exhibition. It is a gentle work and less dramatic than the usual setting of the text. Fauré wanted to compose something quite different from the usual requiems he frequently accompanied as organist. He saw death as a happy deliverance rather than a painful experience and his music reflects this. His melodies, while exquisite, are simple and chant-like. Central to the piece is the stunningly lyrical Pie Jesu. 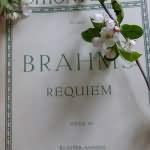 Originally written for boy soprano, it is well known and well-loved even out of the context of the Requiem as a whole. The Requiem stands as one on Fauré’s greatest achievements, which is to say one of the finest works in all of French music. Alison Howell will be the organ accompanist and the conductor is Paul Collacott. Tickets £12, Under 13s free. Entry sign posted off the B4035, 2 miles east of Chipping Campden. By kind permission of the Earl Bathurst, this 10 mile fun ride offers the advantage of no road work and unlimited space. Our well organised event is great as a schooling session for the young horse with a huge variety of inviting optional fences of all sizes - and is equally as fun for the experienced partnerships who want to go round at their own pace. All ages and abilities welcome. With clearly signed trails covering over 1O miles of parkland in Gloucestershire’s most beautiful country estate, the park boasts some of the most stunning vistas in England. Spring is a fantastic time of year to appreciate the seasonal colours of historic woodland and wide sweeping tree lined avenues. So come and make a day of it! (entry via Two Mile Lodge, Stroud Road,GL7 6JT) We are proud to support Wiltshire Air Ambulance. St. George is the patron saint of England. His emblem, a red cross on a white background, is the flag of England, and part of the British Union Jack flag. 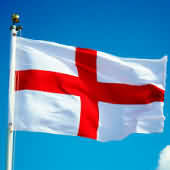 St George's emblem was adopted by King Richard The Lion Heart and brought to England in the 12th century. Many English flags will be flying and events taking place across the Cotswolds and England. 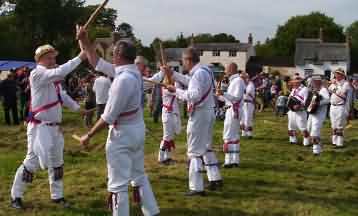 Ilmington Morris Men at The George Hotel, Village of Lower Brailes from 7.30pm. As part of their 20thAnniversary celebrations, the Corinium Players will be performing a Tea-Time recital at the Tetbury Goods Shed. The children will play a selection of solos, duets and ensembles on the versatile classical guitar, from Baroque to the Beatles, plus Latin and popular pieces. 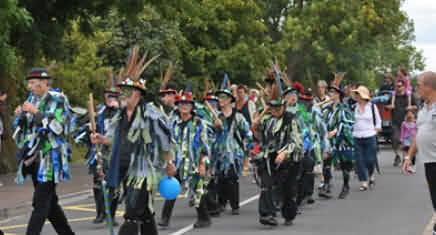 The City men, and many other Morris sides, take part in the traditional May morning celebrations in Oxford. The men can be found gathering on the Oxford side of Magdalen bridge to listen to the choir of Magdalen College singing from the top of the college tower. Dancing begins around 6.15 a.m. in Radcliffe Square, beside the famous Camera, and continues for nearly three hours at various locations, including Broad Street, St Giles, and the Kings Arms! After breakfast most of the teams go off to other events around the district. In recent years, the festivities have continued from midday into the afternoon in North Parade, Oxford, just off the Banbury Rd. The Cheltenham Jazz Festival returns in 2019 with its trademark broad-appeal mix of the very best classic and contemporary jazz, soul, blues and pop. Taking place from 1-6 May, this year’s festival will host an array of world premieres, exclusive UK concerts, and Festival debuts from international superstars and the best emerging talent from around the globe. Gregory Porter, Jamie Cullum, Katie Melua, Level 42, Sergio Mendes, Abdullah Ibrahim, Curtis Stigers, James Morrison, Nubya Garcia, Swing Out Sister and many more to perform. 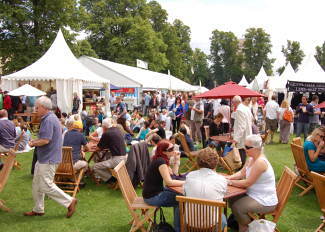 The 2019 Cheltenham Jazz Festival is hosted in a tented festival village in the town centre’s Montpellier Gardens, featuring the Henry Westons Big Top stage, Jazz Arena, Free Stage, Yamaha Discovery Space, a programme of family activities and events and a food, drink and market area. The Festival reaches beyond the festival village into Cheltenham bringing jazz to the streets, clubs and bars of Cheltenham throughout the day until late into the night. Box Office (01242) 227979, www.cheltenhamfestivals.com/jazz/. You are invited to join Heath Farm and our partners Hotel Bell Tent, Lamb Cateringand Katah Eventsat our wedding showcase featuring giant event tipis, a giant flower avenue, cocktail bus and boutique camping options. 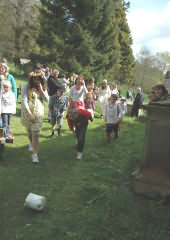 (1st Sunday in May) Randwick Cheese Rolling and Church Service..
Wap information point: 07971 641128. For Places to Stay see - Oxford accommodation; Faringdon accommodation; Witney accommodation. The finest and friendliest gardening event of the year! In its beautiful setting at the foot of the scenic Malvern Hills, this truly inspirational show enjoys a national reputation as the finest and friendliest gardening event of the year. A joint venture of the Three Counties Agricultural Society and the Royal Horticultural Society. On 17 May in 1649, on the orders of Cromwell, three Levellers's leaders were executed outside Burford Church. Each year we gather there for a day of celebration and commemoration of the ideas of the English Levellers' - democracy, equality and religious freedom. Its a day of political debate, radical history, song and music. With high profile speakers, historians, entertainers and family fun, it is a great day out in the heart of the Cotswolds. The day starts with a commemoration by the church and then accompanied by music and song we march up the hill to the recreation ground for a programme of politics, debate, childrens activities, refreshments and music. With speeches, debate, bands, stalls, music, a procession through Burford, the ceremony in the churchyard and much more! Open-air event at Warwick Hall Garden, Burford. Winchcombe is a “Walkers are Welcome” town and a prime centre for people who love the outdoors, especially walking. The status is given to towns and villages that have something special to offer walkers. With pubs, shops and accommodation coupled with a lovely atmosphere and a great location, you can’t go wrong. The historic town is a great walking centre and offers a variety of walks to suit all ages and abilities. There are town walks, historical walks or walks across the unspoilt Cotswold landscape. The variety is diverse, including a Roman villa, a Neolithic burial mound, a steam railway, common land and impressive views across to the Malvern Hills and Wales. Alternatively there are walks where you can discover the beautiful views of the Cotswolds and the flora and fauna of this Area of Outstanding Natural Beauty. “The event is quintessentially British - a mini Goodwood Festival of Speed set in the glorious Cotswolds. It’s a club motor sport at its best, where visitors can mingle with the cars, speak to the drivers, and watch rare historic vehicles to modern day supercars being pushed to their limits”. Nick Mason, Drummer from Pink Floyd, historic racer and avid car collector. 'La Vie en Bleu' returns to Prescott on Saturday 25 and Sunday 26 May 2019. The spectacular two-day event is a firm favourite on the motoring calendar and celebrates all things French & Italian. 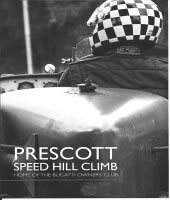 Prescott Hill Climb (Home of the Bugatti Owners’ Club) will once again be transformed into a celebration of fine French and Italian automobiles, action-packed motor racing, and a whole host of entertainment to keep the whole family entertained. Visiting French and Italian car clubs all welcome! Own a French or Italian car? It is thought that the races originated in the 17th Century by young drovers showing off to local women by running up the hill carrying a woolsack. An official race day has been going for over 30 years now with world records entered in the ‘Guinness book of Records’. The course is 280 yards long up and down a hill which has a 1 in 4 gradient, so the men's record of 3.5 minutes is no mean feat! The Woolsack Races form the central attraction of a fund-raising day which includes an all-day street market, a charity auction, a village fete, street entertainers, marching bands and more entertainment for all the family. We have a pretty good idea of what will be on the programme, but please be patient while we apply the finishing touches. The details will be published soon. We hope you will be as excited by it as we have been putting it together. The popular 3 day music festival, held at Riverside Country Park along the banks of the Thames in Lechlade, is heading into its 6th year. Set in the stunning surrounds of Grittleton House, plant lovers and “foodies” are in for a real treat, with the chance to browse the many stalls selling plants from specialist nurseries, stunning accessories for your “room outside”, and delicious local artisan produce. It is going to be a fantastic day out for friends and family. Refreshments will be available. Organised by children's charity Action Medical Research, a special guest appearance by the big fluffy mascot himself, Paddington Bear will be there to greet the younger members of the family. Free parking is available. Details can be found at http://action.org.uk/grittleton. Admission - £3 per adult. Children free. Barnsley Festival, already known and loved by thousands, celebrates its 31st anniversary and was founded by one of Britain’s greatest gardeners, the late Rosemary Verey. The small Cotswold village of Barnsley, still an unspoilt corner of England, holds several examples of her work, from her own splendid garden at Barnsley House Hotel to smaller gardens in and around the village. Our 5th Lechlade Annual Vintage Rally & Country Show will take place at LANGLEY FARM, LANGLEY LANE, CLANFIELD OX18 2RZ commencing at 10am on all days.commencing at 10.00 am both days. Classic cars, classic motor cycles, commercial vehicles, collections, miniature steam, tractors, model tent, classic caravans, crafts, funfair, bouncy castle, face painting, West Oxfordshire Animal Sanctuary, parrots and much more. The fantastic Chadlington Beer Festival – beer, cider, lager, wine, Pimms, gin, live music all day, BBQ, tea tent, kids stuff. Gate price is £10 - this includes a Festival Glass, programme and some beer tokens. There are around 20 ales to enjoy - beer tokens can also be used to purchase cider, Pimms and wine too. Non-beer drinkers are free. Children's entry is £3 per child, with all activities then free and unlimited (except for the face painting). For more information, please go to: www.chadlingtonbeerfestival.co.uk or https://www.facebook.com/ChadlingtonBeerFestival. There is a motivator behind all this merriment, and that is to raise funds for the Friends of Chadlington School (FOCS), with all money raised subsidising some fantastic school trips and paying for the 'extras' that the school wouldn't otherwise be able to afford. The village of Chadlington is three miles south of Chipping Norton and spreads itself out looking across the River Evenload towards Wychwood Forest. The substantial church of St Nicholas is enriched by a fascinating array of gargoyles. For Places to Stay see - Chipping Norton Accommodation. This is the eighth year we have held this event and it grows in size and popularity every year. We will have a large variety of attractions for all the family to enjoy and we expect to have in excess of 300 cherished cars attending as well as a performance arena, a fairground, Local Foods, Craft, Charity and Trade Stands. At St Mary's Parish Church after the evening service crowds wait outside to receive the 'dole' Small pieces of bread and cheese are thrown into the air from large baskets and are caught by parishioners. In past times each person who claimed the 'dole' had to pay a penny which then entitled him to cut and take wood from Hudnalls or the Free Woods. The event is said to date from the time of Milo, Earl of Hereford, in the twelfth century but was first recorded in 1799. Bledington Music Festival. All concerts each day - Concerts at 7.30pm at St Leonard's Church, Bledington. For Places to Stay see accommodation at - Stow-on-the-Wold, Chipping Norton and Bourton-on-the-Water. Box Office (01242) 227979, www.cheltenhamfestivals.com/science/. This year there will be even more craft stalls, and dog agility displays alongside the Dog Show – yes, this is a dog-friendly event. For children there is a small fairground, water splash, bouncy castles, coconut shy, try-your-strength plus many more games. 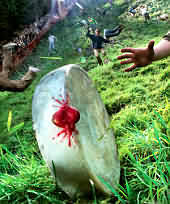 Games for old and young include tug-of-war and egg-throwing. If you need a rest, sit down and enjoy Maypole Dancers, Clog Dancers, Morris Men, the Yarnton Brass Band and West Oxfordshire clarinets. The fête is on Saturday 8th June and runs from NOON to 4pm (food & drink stalls from 12pm) and is at the Playing Field in the middle of Ramsden OX7 3AX. Adults £1 5-15 years 50p Under 5s free. Visit the Ramsden Village Events Facebook page for regular updates. 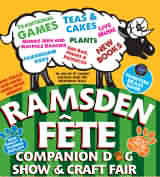 Call 01993 868 764 or email summerfete@ramsdenvillage.co.uk for general enquiries and about stalls. Visit www.ramsdenvillage.co.uk website for general information. There's so much going on at Southrop Village Fete this year! As well as all the usual traditional stalls like Splat The Rat, Kids’ Lucky Dip and the Coconut Shy, you can try your hand at ARCHERY and have a go in our amazing LAND ZORBING ARENA, which is sure to be a hit with both children AND grown-ups! Bring your four-legged friends too and enter them into our fun DOG SHOW. Could your pet pooch win Scruffiest Dog, Waggiest Tail, Most Appealing Eyes or Best Trick? There'll be tea and cakes on offer in the Village Hall, but if you fancy something a bit stronger, Pimm's and local ales will be on offer in the Beer Tent - perfect for washing down our delicious BBQ. It’s lots of fun for all the family so don’t miss Southrop Village Fete on Saturday June 9th from 1pm. We look forward to welcoming you to our picturesque Cotswold village! Organised and supported by villagers to raise funds for upkeep of the local church and our Village Hall this event offers a unique opportunity to visit this very special Cotswold village and see it in detail not normally accessible to the casual visitor. During the afternoon you can amble through a selection of beautiful private gardens. You can browse the stalls enjoy cream teas, homemade cakes or ice creams, play garden games, follow a village history trail, and enjoy a tractor ride through farmland with sensational views. The church of St. John is known for its unusual dovecote above the chancel and its quite exceptional Norman arches in the chancel and sanctuary bathed in golden light. It boasts a wonderful Norman tympanum above the south door. It is said by those who know that it is well worth taking a detour to explore the church and its striking collection of Norman arches and decorative features. On this special afternoon you cannot only soak up the atmosphere, made more special with glorious flower displays but you can also hear the bells and visit the bell tower. The working medieval bell frame has recently been identified as of national historical significance and the bells tell the story of bell foundries from 1657 to 1977. Elkstone lies midway between Cheltenham and Cirencester just off the A435 or A417. Explore the historic Saxon town of Winchcombe when you visit our Open Gardens in June, with an additional exclusive visit to the gardens in Dent’s Terrace, a Grade ll listed set of almshouses. Tickets and maps from Winchcombe Tourist Information Centre or on the day, Back Lane Car Park (in Winchcombe) or any Open Garden. £5.00 per person, under 12s free. Winchcombe lies on the B4632 between Cheltenham and Broadway. The event collects funds for the local church, St Peters, in Winchcombe. This Festival at Cheltenham is a gastronomic delight, with over 226 exhibitors; the scope of local & regional products on show ensures there is something for everyone. You’ll find an astonishing variety of victuals from oatcakes to aphrodisiac Quince, the widest range of baked goods, meats, fish, cheeses, jams, chutneys and much more on offer; this is the regional food event not to be missed. The Bollinger Champagne Pavilion, an exclusive corner of Montpellier Gardens invites you to enjoy the finest perfectly chilled glass of champagne or why not sample the full decadent experience and share a bottle of Champagne on ice, with friends. Open Times: Friday 12noon to 7pm; Saturday 10am to 7pm; Sunday 10am to 5pm. For Places to Stay see - Cheltenham Accommodation. See the environmental initiatives in the churchyard including our wildflower Coronation Meadow now in its second season when we hope several species will be flowering, bug houses installed to encourage wildlife and our environmentally friendly loo. No dogs please. Visit the beautiful Norman church, the highest in the Cotswolds, hear the bells, visit the bell tower and see the environmental friendly initiatives including an eco-loo, emerging wild flower meadow and bug houses. All proceeds from the event go towards the upkeep of our church and our village hall. Cost: Adults £5.00, children free. Come and enjoy a wide variety of gardens and the friendly atmosphere of this beautiful Worcestershire village, situated in the Cotswold Area of Outstanding Natural Beauty, on the lower slopes of Bredon Hill. Light lunches and cream teas served in our refreshment marquee from 12pm, as well as rolls, tea and cakes served by the WI in the Village Hall. Full meals available all day in The Star, our village pub. Quality plants and craft goods will also be on sale. 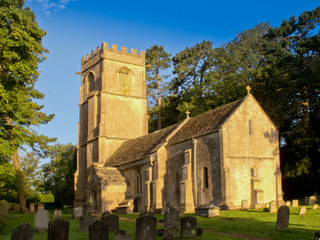 Free exhibition of photographs of Bredon Hill in St Barbara’s Church. Free car parking and free minibus service around the village. Adults £6, children under 16 free of charge. Free illustrated programme for all visitors. To find out more, including photos of previous events, please visit our website at: www.ashtonopengardens.co.uk. Winchcombe is in the Cotswold’s countryside, within a few miles of both Broadway and Cheltenham. The gardens range from designer gardens to smaller and more intimate cottage style. 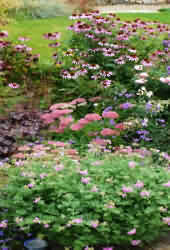 A range of gardens will be open, with a different selection each year. This year we have approximately 17 gardens opening, all within an easy walking distance of the Church. Organized by the Friends of St Peter's Church, a charity helping to preserve and maintain the Grade I listed building and churchyard located in the Centre of town. There will be plants and teas available to buy from 1-6pm from St Peter's Church. 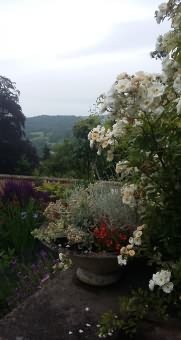 From about 2 weeks before the event from Winchcombe Tourist Information Centre (TIC), or on the day from the TIC from 10am-4pm, Winchcombe's Back Lane car park (near library) from 1-4pm or any open garden from 2-6pm. County: Gloucestershire, Postcode for Sat Nav: GL54 5PZ . Prescott Bike Fest celebrates engineering excellence; from rare, classic, modern, customised to hand built motorbikes and some pretty wacky contraptions too! This year for the first time, the event has been extended to two days. Aside from all the incredible machinery, there’s a stellar line-up of entertainment to keep the whole family entertained. Throughout the weekend there’s non-stop live music, special guest appearances, ‘On the Edge Stunt Show’, Show ‘n’ Tell area, passenger ride experiences, large kids zone, over 100 quality trade stands, clubs, a beer tent, the Blood Bike Village and great food. You can grab yourself a bargain or maybe treat yourself to a new bike from one of the dealers or manufacturers represented including Harley Davidson, Ducati, Triumph, Honda and MV Augusta. Combine the scene of historic road transport with a backdrop of vintage trains at Toddington station . Normal ticket prices for those wishing to travel to Winchcombe or Cheltenham Racecourse Stations , but for those just planning to admire the cars there will be a small admission charge. 2 - 6pm. There will be over 20 private gardens open on the weekend. Tickets available from Campden Tourist Information from beginning of June - £7.50 per day or £10.00 for both days. Teas and plants available. The Three Counties Showground , Malvern, Worcestershire. Long regarded as the region’s rural showcase, and still its biggest annual event, the Three Counties Show is a celebration of British food and farming at its very best. Boasting the real cream of Britain’s pedigree livestock, including rare breeds, it also features a crop of farming displays, together with tasty regional produce, rural crafts, country pursuits, quality shopping and action-packed entertainment. There will be Live Music, Crafts, traditional games, stalls, tombola, teas, food and bar. - a wonderful day out for all the family. A ticket for admission to all the gardens is £5, with children admitted free. Home-made teas will be available in the garden of the Village Hall. All proceeds are for essential repair works to the fabric of Taynton church. We look forward to welcoming you to Taynton. GAMES, STALLS, BBQ AND BAR, LIVE MUSIC. Times to be published later. The Charter Fair is an incredible 788 years old, dating back to 1227 when King Henry III granted the town of Northleach a Charter which allowed a weekly market and an annual fair. The Charter Fair is always the last Saturday of June, that being the closest weekend to the feast day of St Peter and St Paul. much more at Taynton’s traditional garden fête. Don’t forget the children – There’s Splat the Rat, a Duck race, Beat the Goalie and more. 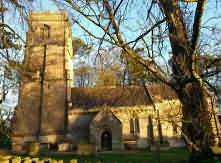 Taynton Church and Village Hall. This two-day FREE celebration for all the family, is organised by Stratforward - Stratford-upon-Avon's Business Improvement District, on behalf of 430 fabulous town centre shops, cafes, restaurants and other professional businesses. Since it was established Stratford River Festival has grown to become one of the region’s leading free festivals. 2018 again brought over 70,000 revellers into the beautiful town of Stratford-upon-Avon. The party continues into the town with so many places to eat and drink or be entertained. Stratford River Festival has won multiple awards including the Pride of Stratford Tourism Initiative of the Year Award, in both 2016 and 2018. Also, the River Festival won Stratford's Best Festival by Stratford On-Line in 2016. 2017 and 2018 - as voted by members of the public. Thank you again! 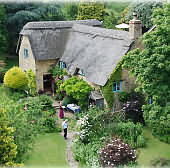 For Places to Stay see :- accommodation at Chipping Norton, Banbury and Woodstock. Two days, 100 acres, hundreds of attractions and 40,000 visitors – the Cotswold Show is now one of the most popular on the regional Country Show calendar. As you look around the Showground it might be hard to imagine that the site has been, at various times, a deer park, a military base, a hospital and the venue for a Glenn Miller concert. Cirencester Park was laid out in the 1700s and a monument erected in 1741 to the memory of Queen Anne by the first Earl of Bathurst, whom she had created Baron Bathurst in 1712, with the help of the poet Alexander Pope. About the place of - Fairford. For places to stay see - Fairford Accommodation, Lechlade Accommodation, Cirencester Accommodation, and Burford Accommodation. The Cheltenham Music Festival is all about high-calibre performances, magnificent venues and a huge variety of music – from symphonic grandeur to the intimacy of chamber music, and from sublime choral experiences to brand new musical adventures. With its excursions, too, into world music, film, dance, the visual arts and the spoken word, it’s a musically-centred cultural banquet that has few equals in the UK. 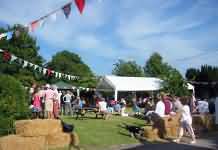 EBRINGTON VILLAGE FETE, SATURDAY, 13th JULY 2019, 2.00 p.m.
Ebrington’s traditional village fete and family dog show is held at Ebrington Cricket Ground on the outskirts of the village with wonderful views towards Broad Campden, Paxford and Blockley. Free parking will be available opposite the cricket ground. Entrance is £1 for adults and children over 12. Money raised goes to the church and the village organizations. By popular demand again this year, Chipping Campden Swing Band will accompany the fete. We are also delighted that the children of Campden Academy of Dance will once again perform dance routines for us. There will also be a display of classic and vintage cars, motor cycles and tractors. All the familiar stalls will be there including: cakes, jams and preserves, produce, books, plants and bric-a-brac as well as flowers, plants, and gift stalls. There will be a grand raffle, bottle stall, traditional Wheel of Fortune, and games such as crown darts, and skittles. For the children there will be a bouncy castle, children’s magic show, traditional Punch and Judy Show, face painting, and jam jar tombola. There will also be a fascinating display of live insects and creatures entitled Life in the Rainforest. One of the main attractions is always the Family Dog Show in which families can enter their dogs in the various categories. This is both entertaining to enter and fun to watch. Bring along your dog for this event. Delicious teas will be served from our marquee, and a barbecue, ice creams, and soft drinks will be available on the field, where The Ebrington Arms, our local village pub, will also be running a beer and cider tent. EXCEPTIONAL DINING, SHOPPING, HOSPITALITY AND VIP EXPERIENCES ON OFFER AT THE MIDLANDS’ MOST STYLISH SUMMER GARDEN PARTY - CELEBRATED BY UP TO 20,000 ATTENDEES. A celebration of the best beer and cider from near and far - a great event in a classic heritage setting. The 2017 Cotswold Beer Festvial will be the 41st, making it one of the longest running CAMRA events. Venue - On the fields behind the Tewkesbury Borough Council offices, Gloucester Road (part of the site of the original battle of Tewkesbury in 1471). Already hailed as Europe's biggest and most spectacular medieval event, Tewkesbury Medieval Festival is planning to make this anniversary bigger and better than ever. The Battle of Tewkesbury in the War of the Roses 1471. There will be the usual battle featuring around 2000 knights, archers and men at arms, a colourful and authentic living history camp with families living in complete medieval style for the whole weekend, and a fascinating market selling everything from medieval pots and authentic costumes to toys and individual jewellery. But this year plans are also in hand for a joust with knights on horseback meeting in combat, a huge street procession, entertainment both on the fair site and throughout the town and much, much more. The festival will take place on fields behind the Tewkesbury Borough Council offices in Gloucester Road, part of the site of the original battle of Tewkesbury of 1471. Ample parking is available, for a small charge. The site will be well marked from the town centre and from junction 9 of the M5. 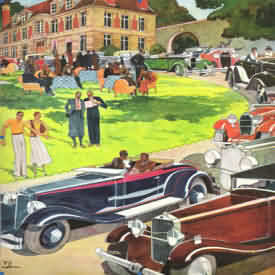 Welcome to Pre-War Prescott – a unique motoring event for all pre-war car owners. Enjoy the relaxed atmosphere among old friends and new and experience the unrivaled opportunity and thrill of driving your car up this historic speed hill climb venue in the glorious Cotswolds. Prescott is owned and operated by the Bugatti Owners Club and the event is being hosted by the Vintage Minor Register. Untimed climbs will be available throughout the day for all pre-war cars – saloons included. No racing license, helmets or flameproof overalls are required, there is no scrutineering and you can take passengers including children up the hill. Come for a delightful family day out in the country. Held at the Great Barrington village hall, set in the beautiful landscape of the Windrush Valley: a traditional fete with refreshments including teas, cakes, BBQ, ice creams and Pimms; competitions for fruit and vegetables, flowers and flower arrangements, arts and crafts and children’s classes; stalls and popular games; a tombola and raffle; and band. Bring your dog for the Dog Show and Agility Competition! Every summer thousands of concert-goers pack up a picnic, stock up on fizz and join the party in the stunning grounds of Blenheim Palace for the Battle Proms Concert. In a very special Blenheim Palace Battle Proms event, 150 re-enactors will participate in a skirmish as part of the Road to Waterloo programme of events marking 200 years since the Battle of Waterloo. Welcome to the 40th Warwick Folk Festival! Year on year, our visitors tell us that Warwick Folk Festival has one of the best festival sites around . If you've not been for years, come and see what's changed. If you've never been to Warwick Folk Festival, come and see what you're missing! Traditional Village Fete set in beautiful gardens. 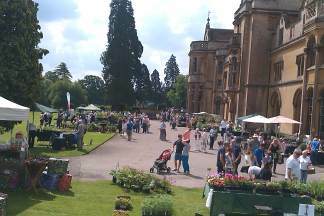 Stalls include: Produce, Plants, White Elephant, Tombola, Books. Fun Dog Show – starts at 3pm. Entrance fee £2 per class. Many games & activities for the whole family. Teas & Ice Creams, Barbecue, Pimms tent, Gloucester Excelsior Band. Stroud Vintage Transport & Engine Club (SVTEC) stage the Annual Gloucestershire Vintage and Country Extravaganza at South Cerney Airfield in Cirencester, Gloucestershire. The show is widely regarded as one of the biggest and best Steam, Vintage and Countryside events in the UK and attracts thousands of exhibitors and visitors from across the country whilst actively raising thousands of pounds for both national and regional charities. This very popular event is organised by the VSCC and for further information please contact the VSCC on tel.no. 01608 644777. The first weekend of August this year sees the Club’s annual Speed Hill Climb at the wonderful Cotswold venue. This much loved event will see 260 cars climb the venues short-course; practicing on the Saturday and racing against the clock on the Sunday. The Orchard will again be full of Pre-war cars, whilst the trade stands and auto jumble will remain in place. The Saturday evening traditionally sees live entertainment in the form of bands, whilst the Sunday morning opens with the annual Bike Race. 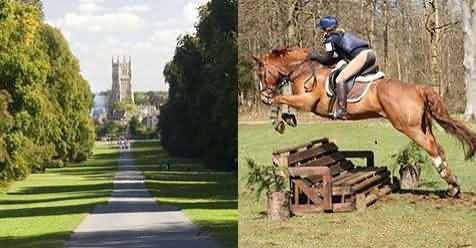 Five action filled days of horse trials in Gloucestershire all held within the stunning surroundings of Hartpury College. The event gets underway with the Dubarry Burghley Young Event Horse Qualifiers on Wednesday before moving onto the Optimum CCI1*, Magic CCI2* and Superflex CIC3* from Thursday. Steam Engines, Displays, Collections, Farm Tractors, Fair Organs, Fairground, Military Vehicles, Vintage & Classic Cars,Period Caravans, Motorbikes, Commercial Vehicles, Auto jumble. The Evesham Festival is like no other angling festival in the country. spectacle that you cannot afford to miss! Join us on August Bank Holiday Sunday for a selection of cask ales, ciders, wines and prosecco as well as soft drinks, BBQ, cakes and teas at this picturesque riverside setting on the banks of the beautiful River Windrush. There'll be music, children's rides, duck races and a variety of stalls raising money for village organisations. Keep up to date with plans on Facebook events Minster Lovell Beer Festival. Organisers of the Winchcombe Country Show are promising another bumper show this year. The event takes place on Bank Holiday Monday at Winchcombe Senior School Playing Fields and brings you the best in country show fun. 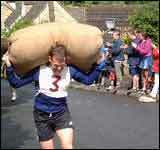 The annual procession through the pretty Cotswold village will have an Olympic Rio theme this year. The procession which starts at 11.30am from the Abbey Field Centre in Back Lane will feature vintage tractors, fancy dress contestants and the Happenstance Border Morris dancers. 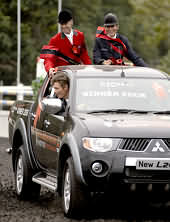 The procession will arrive at the show site for 12.00 noon. A key element of the event will be the traditional flower show with many classes featuring creative floral displays, arts, crafts, photography, wine, cookery and preserves. There are lots of prizes and over 50 trophies up for grabs! 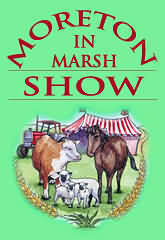 The show is a community event and a quintessentially summer occasion for all families to enjoy. It will be jam packed with activities to keep you entertained all day - such as Indian Runner Duck Herding, Olympic It’s a Knockout, the Happenstance Morris Dancers, go-karting, a traditional Punch and Judy show, street entertainment, face painting and much, much more. The Winchcombe Brass Band will be providing the musical backdrop for the day. There will be many dog friendly games including terrier racing, dog scurry and have a go agility. Please bring your dogs along so that they can enjoy the day as well. There will many refreshment stands to keep you energised all day including a tea tent serving delicious homemade cakes and a licensed bar. On Sunday 28 August prior to the show there will be the Run Winchcombe Event at Sudeley Castle featuring a 5k fun run, a 10k hill climb to the Neolithic long barrow Belas Knapp for the more adventurous and a 1k for 10s and under. An action packed family weekend for all. Please come along and support this traditional country event. Sunday 18 August 2019 will see The Rotary Club of Tewkesbury stage their popular Classic Vehicle Festival at Tewkesbury School Playing Fields. The event features a spectacular display of over 1000 classic vehicles, from the dawn of the motoring era, to pre-war, post-war, American classics, custom cars, hot rods, supercars, motorbikes, from those of historic and engineering significance to mass produced retro run-abouts. This year commemorates the 110th anniversary of the iconic French car manufacturer ‘Bugatti’ plus, the 90th Anniversary of the Bugatti Owners’ Club based locally at Prescott Hillclimb. The cars are world renowned for their design beauty and race victories. Famous Bugatti’s include the Type 35 Grand Prix cars, the Type 41 "Royale", the Type 57 "Atlantic" and the Type 55 sports car. To honour the Molsheim marque the festival will showcase a special collection of vintage Bugatti’s. The event website is www.tetburyclassiccarshow.org. Here you can apply online as well as find our other details about the event. Exhibitors free entry. Public £5 adults under 16 Free. Lots to do for all the family. 450 Classic vehicles on display. Come and spend a lovely day with us. Tetbury town centre next door. More information contact John Billington 01666 593952. It happens every Bank Holiday Monday in August in the River Windrush in the centre of Bourton-on-the-Water. Two teams of players from Bourton Rovers Football Club indulge themselves in the crazy 'sport' of trying to get a ball through the water and past each other into the goal. Despite the huge amount of splashes, large numbers of spectators turn up - some carrying umbrellas to try to stay dry. Bourton-on-the-Water for Football in the River kicks off once again on August bank holiday Monday. A fete will be held from 11am, with the football match kicking-off at 4pm. Didmarton Bluegrass Festival is one of the UK’s premier Bluegrass, Americana and Old-Time music events, held every summer at Kemble Airfield in greenest Gloucestershire. Kemble Airfield is one of the UK’s quirkiest Festival sites, with vintage bi-planes flying overhead and the guys and gals from the Ogri Motorcycle Club serving a fantastic selection of real ales and ciders at good prices. Experience three days of sensational music on the Main Stage and while late nights away around the bonfire with some really great jam sessions. This promises to be a fun-packed afternoon with a great blend of traditional and modern village fete activities; Cow Pat Bingo, Egg Splat, The Red Barrows, Fun Dog Show, Human Fruit Machine, Local Craft Stalls, Produce Show, Street Food, Beer Tent, Afternoon Teas, Tombola, Skittles, Coconut Shy and so much more! £3 for adults, under 16s free of charge. Pebworth Village Hall Green. CV37 8XA. 7 to 8 September 2019 - Prescott Hill Cimb - British & Midland Championships Weekend. The Prescott Gold Cup is open to all members of the Bugatti Owners Club. At the beginning of the season times are set for each class. Competitors who beats the target time for his or her class by the greatest margain over the three national events, wins the acolade. This is the decider! One of the country’s biggest one-day agricultural shows has something for everyone to see, do, taste and buy. That’s its appeal and what organisers pride themselves on providing. There are 350 trade stands showing or selling everything, from Combine Harvesters to Wellington boots and the very best locally produced food. All day, too, there is some thrilling entertainment in the Grand Arena and Attractions Ring. There is even dancing sheep..
Nestled on a hillside in the Cotswolds, just on the borders of Eastington and Northleach, lies the showground for the Northleach Steam and Vintage Show. Whilst this may not be one of the biggest shows in the country, the show’s heritage and relaxed enjoyable atmosphere set in the idyllic Cotswold countryside gives it a uniqueness of its own. This year’s show looks to be even bigger than last years, with more engines and vehicles on display, lots more stalls and a greater variety of food offerings from burgers and Cornish pasties to hog roast, al fresco Italian to Mexican, donuts, ice-cream and cakes as well as traditional confectionery to bring back memories of bygone days. Red Lion Inn will be hosting its own Ale Festival at the show with live music throughout the day, and for the children there will be additional entertainment including fun fair amusements, ferret racing, airsoft target paintball, have-a-go archery and even a climbing wall. It is even hoped to have the threshing machine that once used to appear at the show all those years ago restored and working once again on the showground. One of the world's premier five day events. 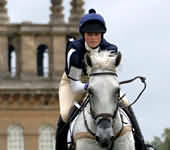 Set in the magnificent grounds of Blenheim Palace, at Woodstock, Oxfordshire, and with the Palace as the back drop for all main arena action, the horse trials offers a fabulous opportunity to see some of the world's finest riders and their horses compete against one another in a truly spectacular environment. Welcome to Gloucestershire's largest free to enter one-day festival. The Newent Onion Fayre is back once again, complete with the opportunity to witness the world-famous onion eating competition with your very own teary eyes. Every two years Minchinhampton celebrates its Country Fayre. The event is designed to be a great community day, the funds from which are distributed to local charities. This year’s event will start with a cavalcade of vintage cars driving through the town followed by a procession of local groups and children. The town crier will then open the Fayre. The Fayre takes over the High Street, Market Square, Bell Lane, the entire school grounds and spills out on to the Great Park with a huge variety of stalls and displays. Clowns will wander among the crowds to entertain visitors as they go. Refreshments will be available in the Food Court area and will include pulled pork baps, sausage baps, pizzas, omelettes, chips, pies and pickle, ice creams and a beer tent. The various cafes in the town will be open and additional refreshments will be available in the church porch room and school hall. The fayre is free to enter and free parking is also provided. Frampton on Severn, Glos. 10am to 5.30pm. Hello......Avening wants to tell you that the Pig Face Day and Queen Matilda's Feast is being celebrated in full costume, with hog roast, jesters and band and starts in The Church of the Holy Cross at Avening near Minchinhampton at 6pm. The celebrations will finish about 10pm. Pig Face Day held on Holy Cross Day in September in Avening. Starting at 6pm with the Traditional Candlelit service with the presentation of a Boar's Head by Queen Matilda. Everyone is invited in Medieval dress to commemorate the one and only commissioning of a Church by a Queen of England. 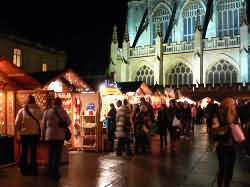 The service is followed by a torchlight procession to the Feast where there are to be Jesters, Jugglers and fire eaters. All enquiries (we can help with costumes) to Click Mitchell at clickmitchell@aol.com or tel. 01453 836390. The annual Jane Austen Festival in Bath. 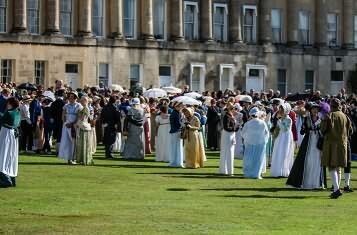 We expect nearly 4000 people to attend over 80 events, opening with our world-record setting Regency Costumed Promenade, raising money for the Cancer Care Campaign at the Royal United Hospital here in Bath. We have a huge range of events for film fans and book buffs alike, including workshops, dances, balls, readings, talks, concerts and theatricals. Our theme book for this year is Northanger Abbey (first published in December 1817 and set in our very own city of Bath), so expect a touch of the gothic about the Festival this year! We have Northanger Abbey themed tours, a theatrical production and will be reading through the book every day in Bath Central Library. Lizzy Bennet loved walking and there are plenty of walking tours – both serious and scandalous – that allow everyone to enjoy Bath’s beautiful architecture and scenery while celebrating all things Austen. This is held on Feast Sunday, the Sunday after Feast of Nativity of St Mary. The church is 'clypped' or embraced by parishioners while the 'Clypping Hymn' is sung. Held on Sunday of the 19 September or the first Sunday afterwards. This ceremony is said to symbolise the parishioners' love of their church. This Feast Day was once notorious in Painswick for riotous behaviour and for 'Puppy-dog pies' said to have been baked by a publican desperate for meat to feed the visiting crowds. This is still celebrated by baking china dogs into pies and cakes sold on the day. The best in Classic Cars with Championship rounds on Saturday for TVR Car Club, TR Register, Historic Rally Cars, American Marques, the final round of our New Barn 'B' Licence Roadgoing Championship as well as the Bugatti Owner's Members Handicap. Sunday sees Championship rounds for 500 Owners Association, Austin Healey, Morgans, Aston Martins, American Marques, the final round of our Henney's Cider Classic Championship as well as the Bugatti Car Handicap. The UK's biggest indoor equestrian event, Horse of the Year Show. 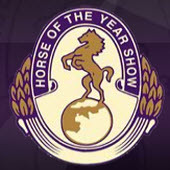 Horse of the Year Show (HOYS), which takes place at The NEC. NEC hosts the finals of the most highly regarded national showing and show jumping championships and celebrates the end of the competitive season in true style with five days action packed with all things equestrian. From stunning displays to tense competition to endless shopping HOYS is a spectacular not to missed. The Festival will be centred around Banbury Town Hall, where there will be extra concerts using the new function room as well as the main hall. Other events will take place at Drayton Leisure Golf Centre, Banbury Folk Club’s great new venue at the Banbury Cross and at the Reindeer Inn. Camping is included in the weekend ticket and a shuttle-bus service will run between the campsite and the Town Hall. We have tried to cater for all tastes with a wide variety of artists taking part in the concerts and events. Some festival favourites, but also some you may not have seen and heard before. The Times Cheltenham Literature Festival promises to be a world renowned 10-day celebration of reading, writing and authors once again this autumn – with guest speakers set to include literary legends, politicians, designers, comedians and stars of the stage and screen. For book lovers, Cheltenham is the only one place to be this autumn. Whether you’re looking for the biggest names in fiction, politics, television, art, food or sport, The Times and The Sunday Times Cheltenham Literature Festival has it all. 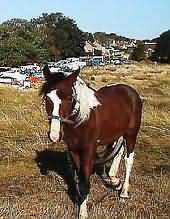 Thursday 24 October 2019 - This year's second Gypsy Horse Fair at Stow-on-the-Wold. 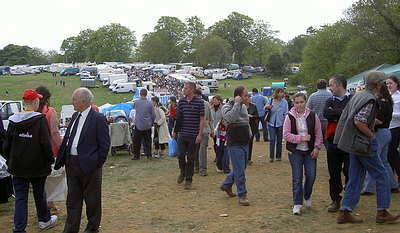 The gypsy horse fair attracts hundreds of sightseers to Stow twice a year. Gipsies gather from all corners of England for a meet and greet and hundreds of horses are paraded and sold, all in one day. It's quite a site! So how did it all begin and why Stow-on-the-Wold. As you might expect, when dealing with a Cotswold tradition, you have to go back a very long way. The November Meeting at Cheltenham Racecourse, is three days of the best that racing has to offer and is the biggest and most important meeting of the first half of the Jumps season anywhere in the country. It provides thrilling competition between many of the best Jump horses in Europe, large and enthusiastic crowds creating a special atmosphere. Running for the second time due to the popularity of public demand set between the Roman Baths and Bath Abbey. 30th NOVEMBER and 7th DECEMBER 2018: LATE NIGHT SHOPPING 5.30-8.30pm. Music ~ Street Entertainers ~Double Decker Bus Rides ~ the Local Fire Service Fund Raising ~ Tree of Light ~ Mulled Wine ~ Festive Food ~ plus Great Shops & Eateries! Showcasing a range of wares from jewellery and jigsaws to hand bags and knits; woodcraft and paintings to photos and cards; soaps and wax art to fashions and cushions, there’ll be stalls to suit all interests and ages. Moreton's 7th Christmas Market with over 50 stalls lining the High Street selling a great selection of Christmas gifts and food including soaps, candles, jewellery, hand made products for the home, wooden gifts, festive wreaths & garlands to name a few. Further Charity and Local Organisation stalls in the Redesdale Hall, also from 9 am. Local singers and carol singing by the local schools will be on the stage during the day. Carol Service in the afternoon followed by the arrival of Father Christmas & Light Switch-On. Father Christmas will then be in his Grotto in The Redesdale Hall for Children to visit him. Starts at 9 am Free Entry If you are interested in having a Market Stall or Charity/Local Organisation Stall please contact Maria at tiamaria.burns@hotmail.co.uk for more information. Christmas Advent Festival. 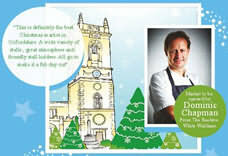 Organised and partially funded by the the Winchcombe Forum, the festival will see shopkeepers, restauranteurs, businesspeople and publicans alike joining forces to celebrate the festive season in style by laying on Christmas offers, events and entertainment for shoppers and visitors who visit the Cotswold town throughout December. More details will follow nearer the time. Come and indulge in the world of chocolate making in a 2 to 2.5hr workshop. Feed your passion by not only by working with Belgian chocolate and learning some basic techniques, but having the opportunity to sample too. Working in pairs, you will learn how to flavour truffle fillings and develop skills in mixing, piping and coating. Altogether you will make 31 truffles. And finally, you can indulge in gift wrapping before taking your delicious creations home. These workshops are set in a relaxed atmosphere and are suitable for all age groups and levels of experience. 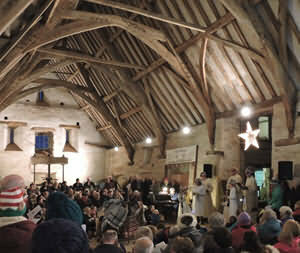 The medieval barn makes a very atmospheric setting for this family-friendly performance of the Christmas story from members of St Michael’s Church. Enjoy a cup of mulled wine or fruit juice, and a mince pie, and join in all the well-known carols. Gates open at 3.30pm and the performance starts at 4pm and lasts about an hour. The Barn is an unheated medieval agricultural building so wrap up warm and wear suitable footwear. Parking is limited so please walk from Winterbourne if you possibly can. If you do need to bring a car, please enter Church Lane from the Beacon Lane end (ie. one way system exiting onto Winterbourne High Street) to avoid congestion, and do not block the lane for emergency vehicles. Tickets must be pre-booked - £2 adults, £1 children under 16, (includes mulled wine/mince pies), from Daisy’s Coffee Shop, Winterbourne, or ring Gill 01454 774479.